* Classes will for Friday evenings, Saturday afternoons and some weekday evenings. * Classes are held in your home. After more than 12 years of experience, The Pasta Company has finally opened the doors to the public permitting any ‘foodie’ to experience these spectacular cooking classes. Our school promotes a style of cuisine originating in Sorrento, also known as ‘Terra delle Sirene’ or the ‘Land of Sirens’ and our mission is to share our love for good food, especially pasta, here in Australia. Our classes will introduce you to the very best pasta ingredients including doppio 0 flour and free-range eggs to create our amazing pasta/pizza and gnocchi dough. We will share our family secrets to help you transform your dough into delicate spaghetti, linguine, fettuccine, gnocchi, tortelloni and ravioli. Finally, we will show you how to prepare and cook your own tantalising dishes to bring home to your families. 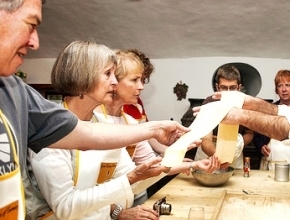 CLASSIC LASAGNE / CANNELLONI – Learn the time-honoured techniques to a family favourite! RUSTIC ITALIAN PIZZA – Discover true Italian flavour combinations. HANDMANDE GNOCCHI – Master the hand-craft of beautiful fresh gnocchi. SUMPTUOUS FRESH PASTA – Learn the secrets to making fresh light pasta. Vegetarian and gluten-free dishes available – please let us know when booking. Your own class creation to take home! Use this form to contact us and/or receive more information about our cooking school. Fill in the obligatory fields (*) and specify your request and our operator will respond in the shortest time possible.